In 1972, Luke Elrod, honorably discharged from the JAG Corps of the United States Army, began eight years of general practice in the upstate of South Carolina. In 1980, Luke returned to Rock Hill, South Carolina and started his own practice, The Elrod Law Firm, focusing on personal injury and workers' compensation claims. During the ensuing years the firm's practice expanded and a number of partners, many former prosecutors, joined the firm. David Benson joined the firm in 1990. Also a former 16th Circuit Assistant Solicitor, David has used his experience to fight for injured workers in the Workers' Compensation arena. David is committed to serving his clients with faithfulness and dedication. His fearlessness and perseverance have proven advantageous in the courtroom as evidenced by 25 years of successfully litigating workers' compensation cases. Harold Staley began his legal career working in the Low Country of South Carolina. He served as a judicial law clerk for the Honorable R. Markeley Dennis in the 9th Judicial Circuit. He also worked as a prosecutor in the 16th Circuit prior to joining The Elrod Law Firm in 2002. Harold is experienced in both Personal Injury and Workers' Compensation litigation and is licensed in North Carolina as well as South Carolina. 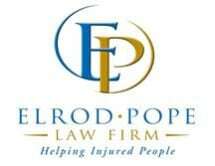 In 2007, former 16th Circuit Solicitor Tommy Pope joined the Elrod Law Firm and we became the Elrod Pope Law Firm. Tommy brings over 25 years of courtroom and trial experience to the practice.